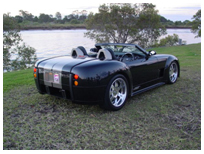 DRB Sportscars manufacture Cobra and GT40 replica vehicles and have just commenced producing a new Roadster, the DRB 540, a similar looking car to the Ford USA Shelby Concept Cobra displayed in the USA during 2004 with a fantastic response, however Ford did not proceed with production. DRB was established in 1980 and have built most of the kit cars in Australia (in excess of 1,200) with over 400 Cobra and 100 GT40 replicas. DRB body/chassis units and components, as well as being exported to agents in overseas countries, have been delivered to customers in every state and territory in Australia. Customers have been from all age groups and varied trades and professions. 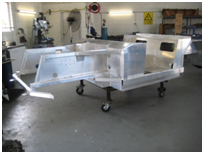 The DRB 540 has an advanced aluminium monocoque chassis and by working closely with Peter and the design team at DRB Sportscars, Barry’s Laser Cutting and Metalwork’s are laser cutting and folding 90% of the components that make up the chassis and also the accessory package of parts that greatly assist customers with the assembly their own car. 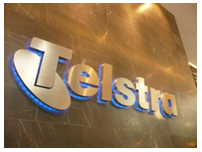 Signtific Signs (Aust) Pty Ltd has been operating on Queensland’s Gold Coast for over 20 years and has become one of the most prominent and competitive sign companies in Australia. The company is family owned and operated and all signs are crafted and installed by a team of highly experienced and qualified tradesmen with a combined experience of over 35 years in the signage industry. We have the ability, know -how and facilities to develop a signage program to suit every situation, from an illuminated spectacular to simple banners and a-frames. 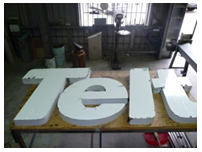 All our custom made signs can be installed on site locally and/or interstate by our fully qualified installation team. Barrys Metal Works are issued a scope of works to provide laser cutting and fabrication for Signtific Signs. CAD drawings are issued and cutting patterns for the laser are developed. The finished laser cutting is then passed on to the boys in the Metal Works Department for intensive manipulation to produce the stand-off required by our customer. The finished product is protected at every stage so both our customer and the ultimate end user is guaranteed total satisfaction! 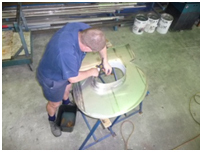 In July of 2008, we were approached by an overseas interest that wanted to develop an Australian made ‘Wind spinner’ for the local market and for export. 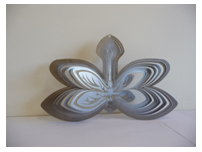 These fascinating designs use high speed, intricate laser cutting, together with rust-proofing and powder-coating to achieve an eye catching, decorative item that has sold over 40,000 units in the Asia - Pacific rim. 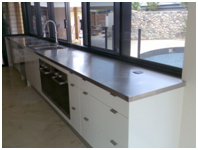 Total Concept Group is a Gold Coast based, family owned company. We are an approved Alspec, Capral and Olympic Aluminium commercial window and door manufacturer. We offer a comprehensive range of Aluminium windows, Bi-folds and sliding doors designed to meet any specific building requirement and Australian Standards. 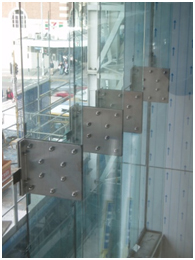 We also have available a custom design service for architectural applications, glass assemblies and curtain walls. The team at Barry’s has laser cut 12mm Stainless Steel plate and polished and welded for use in commercial office space in George st, Brisbane. Communication, teamwork and enthusiasm make Capri Kitchens a cut above the rest. David and Veronica run the business with a vision of excellence, and a close eye on customer service. They’ve got a great team backing them up too, with people like Terry, Jake and Tim always ready to go the extra mile to deliver a result you’ll love to live with. It really makes a difference when the team that builds your kitchen love what they do – that’s Capri Kitchens. 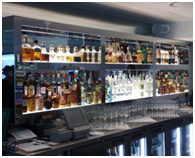 Capri Kitchens supplies the wooden frame made to measure then our boys in the Metal Works Department go to work on the Mirror Stainless (No.8), cutting and fabricating to perfect dimensions to achieve this stunning effect in the Beluga Bar, Main Beach, Queensland. Alto vista is an Australian, family owned and operated company which first started trading in 1988. The company offers ONE STOP SHOPPING solutions for all gate and fencings requirements. 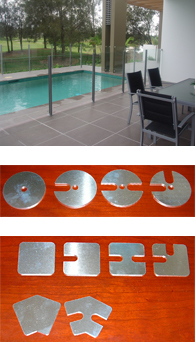 Alto Vista has a website which has been custom built for the DIY glass pool fencing market. Barry’s Laser Cutting produces essential components for Alto Vista used in their frameless fencing operation which are then powdercoated to their clients individual needs. Parts that may have previously taken hours to produce are lasercut in seconds making this a streamlined production process. EDMO the pioneer of OTR tyre changing, commenced operation in 1970 with the invention of the EDMO TYRE PRESS and hydraulic JACKS. It was apparent at the time that there was a need for a safe and quick way to change the gigantic tyres on the off the road mine vehicles, and how to lift these massive machines for maintenance work. The team at EDMO have developed parts for heavy lifting equipment which requiring laser cutting and fabrication. Through collaboration in design both companies now have a streamlined manufacturing operation. Barrys Laser Cutting laser cuts the 2mm Mild Steel patterns and forwards these to the tradesmen at Barrys Metal Works to fold and weld into the finished product. The design guru’s at Barry’s Metal Works have come up with patterns to suit almost any work ute application. These boxes were made for one of our regular clients in May of 2009. The Landcruiser was left with our designer to achieve maximum storage space under the tray. Patterns were developed for laser cutting to minimise folding and welding and the Metal Works Department took care of the fabrication. This stainless steel benchtop was fabricated from laser cut patterns, complete with two, large, hand-formed stainless bowls. Through working closely with our customers, BMW does a site visit to determine the exact requirements of our customers and take accurate dimensions to ensure we install a top quality product that achieves total customer satisfaction. Storage boxes for the ever popular Toyota Work Mate mounted neatly under the tray, behind the driver for convenient storage which fits snug against the mudguard for maximum use of space. These are made from robust, 2.5mm Aluminium treadplate for durability rather than the thinner quality you will find in other products. These are kept in stock and ready to purchase for your convenience. Also added to the vehicle photographed here, is a safety mesh screen, welded in place behind the cab.